From my house on South Fidalgo, I have a grand view of Whidbey Island. 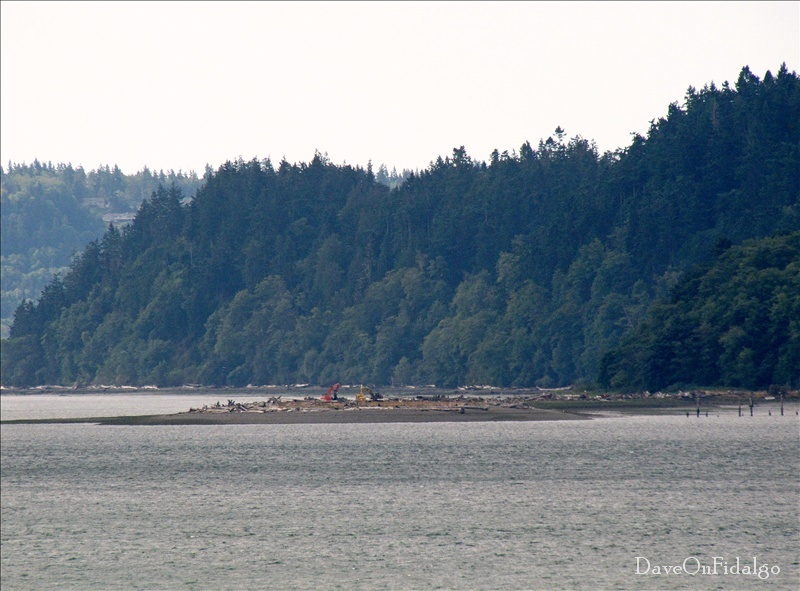 I can see a sand spit over there that sticks out into Skagit Bay. I discovered it is called Ala Spit and it is an Island County park. I drove down this week for a close up look and to get some photos. As it turned out, it was closed. Apparently a project is underway to restore salmon habitat. I missed it by two days. The earth moving equipment can actually be seen in the long zoom photo above. I will try again in November when the park is scheduled to reopen. 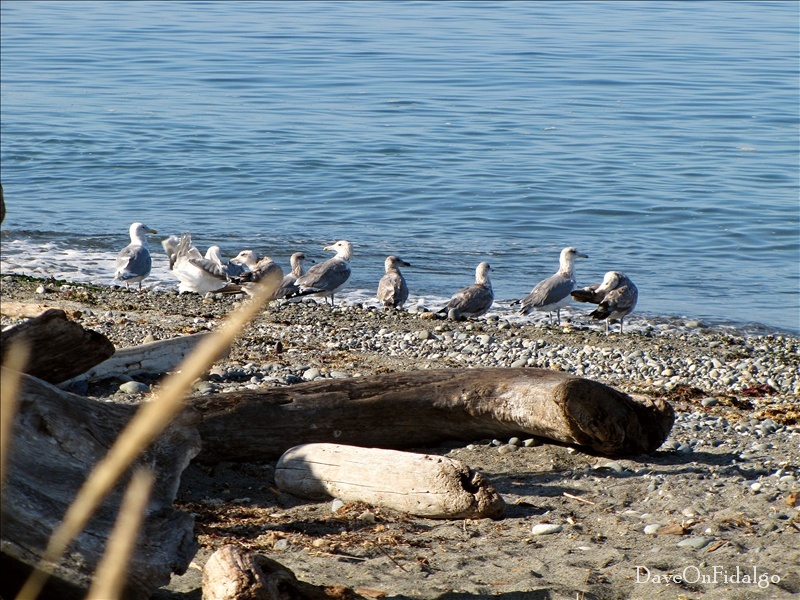 Since I was on Whidbey Island with a camera hot to trot, I decided to swing over to West Beach in Deception Pass State Park. In retrospect, an unscheduled detour to West Beach is really not such a bad thing. I wanted to check out a big rock there, just off shore. I am told Black Oystercatchers can be spotted resting on it during the fall and winter. I started at North Beach near the amphitheater (above) to get a shot of the Deception Pass bridge. Unfortunately, the morning sun was right behind it ruling out any photos. More about that later. The rocky shores marine habitat is the most common type of shoreline in the region. 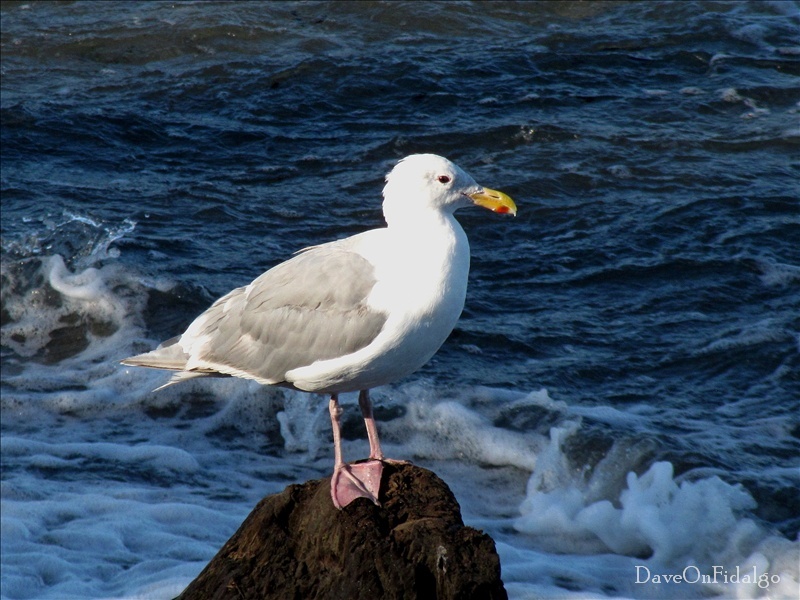 There were no Oystercatchers visible on the rock this day, but nearby, this Glaucous-winged Gull agreed to stand for his portrait. This is our most common gull identified by pink feet and legs, the red spot on the bill and gray wing tips. 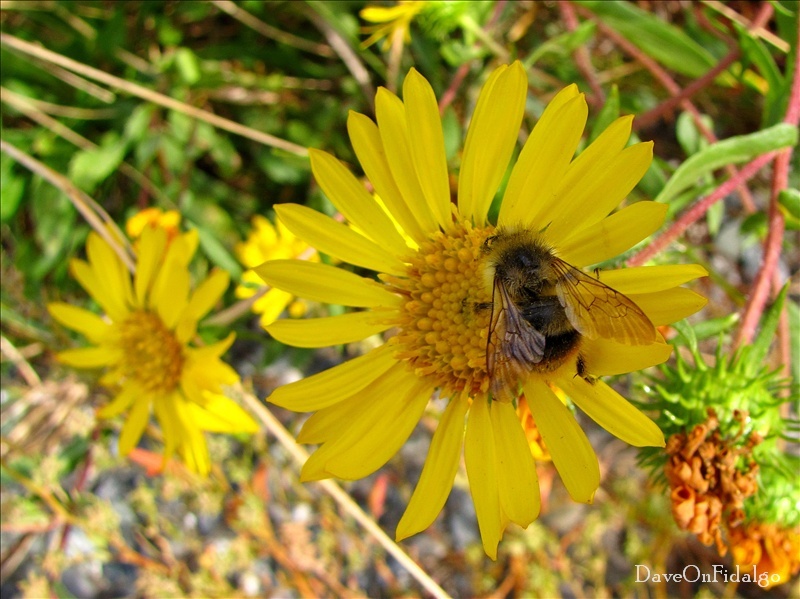 Another photo of this fellow is posted at Wild Fidalgo. I have noticed that gulls seem to like to stand on rocks and they are very patient about being photographed. 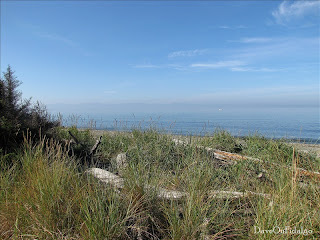 The attractions at West Beach include the unique sand dunes which separate Cranberry Lake from the Strait of Juan de Fuca. I met this Douglas Squirrel (Tamiasciurus douglasii) along the path to the dunes. Tail snuggled up and feet tucked in, he was obviously cold from the morning chill. They usually bark incessantly when you enter their territory. This one seemed content to just share the morning sun. I left him alone to warm himself. An asphalt nature trail provides a self-guided tour of the sand dunes. Beautiful interpretive signs were prepared by marine science students at Anacortes High School. The quotations in this post all came from those signs. Along the inland Salish Sea, sand dunes are a unique geological feature. Bordering the Strait of Juan de Fuca, the conditions here are similar to open oceanfront. Winds off the Strait brought the sands that built these dunes over thousands of years. 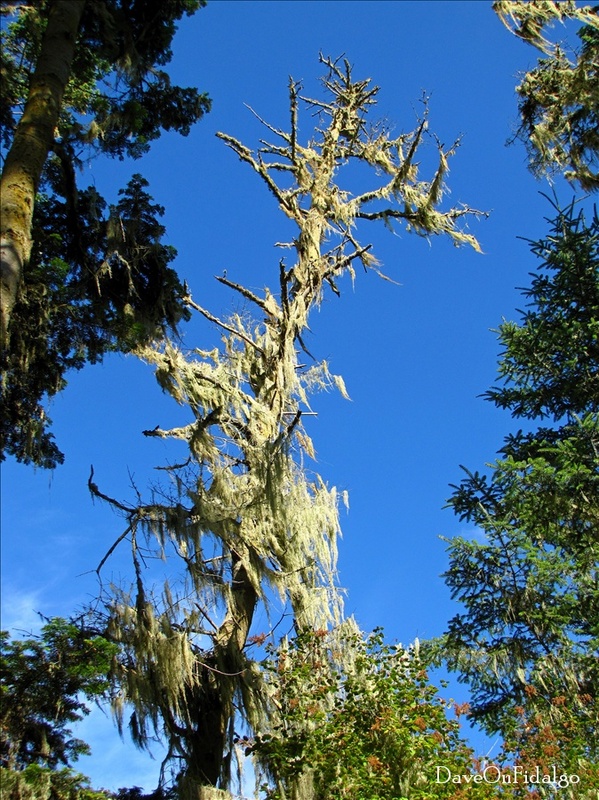 Sitka Spruce, normally lofty conifers, and Shore Pines grow close to the ground under these conditions. The foredune next to the beach is stabilized by the beautiful Dunegrass, Elymus mollis. 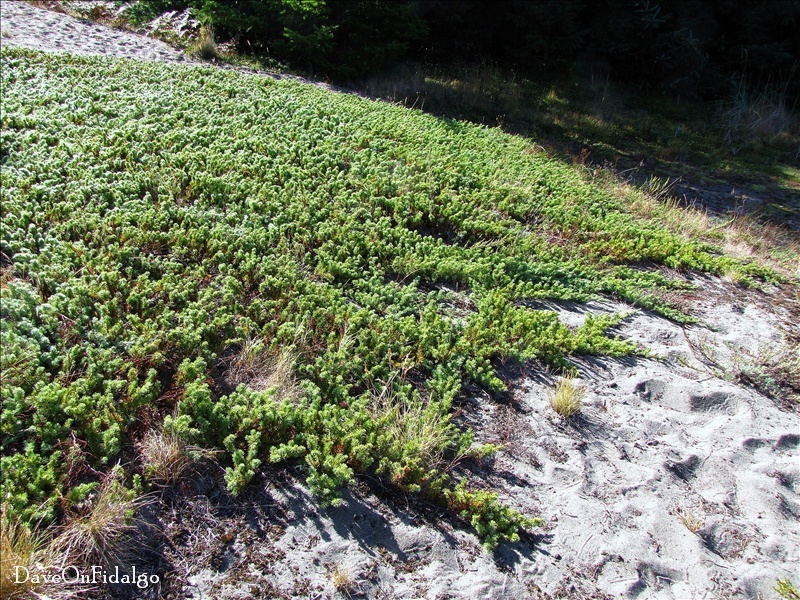 The foredune is this ecosystem's first line of defense against the maritime elements. The chilly morning air produced foggy conditions out in the Strait obscuring views of the Olympic Mountain Range. 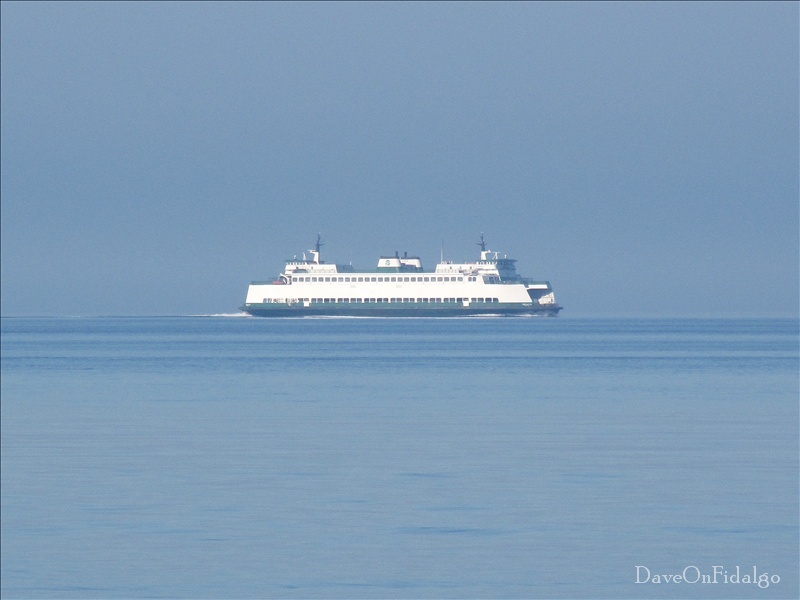 In the fog, I spotted a Washington State ferry, the M/V Sealth sailing north. 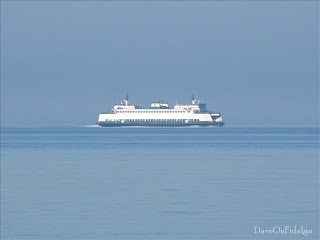 This boat is currently assigned to the Anacortes-San Juan inter-island schedule. I am not sure what she was doing out in the strait. This is not part of a normal ferry route. of human presence for several thousand years. Don't think for a minute that sand dunes are barren and lifeless. This "murder" of Northwestern Crows (Corvus caurinus), about two dozen in all, were busy gleaning the foredune. "Murder," by the way, is the term for a group of crows. Getting a photo of the entire group would have necessitated stepping off the path and that's a no-no. Crows are allowed on the dunes, but for their protection, people are not. Meanwhile, a "squabble" of gulls had gathered to socialize on the beach. These appear to be Western Gulls (Larus occidentalis), identified by their black wing tips. I could be wrong. Gulls are very difficult to differentiate. Local species hybridize freely making this even more complicated. until the hour of separation." At the edge of the backdune this Douglas Fir (Pseudotsuga menziesii) has survived for more than 850 years. 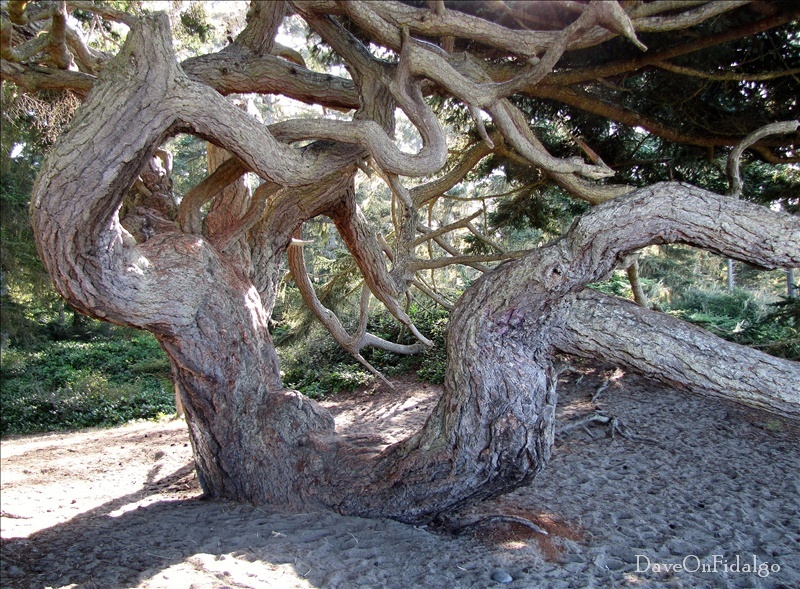 Imagine the forces and conditions that shaped the tree in this manner. This is a study of the main trunk of the tree which we have seen here before. "Come boy, sit down. Sit down and rest. And the boy did. And the tree was happy. The end." The trail enters a small, specialized dune forest next to Cranberry Lake. At the edge, there appeared to be a conifer, fir-like, growing prostrate along the ground. I have no idea what it is, or even if it really is a conifer. None of my books or the internet revealed its ID. I would appreciate hearing from anyone who can help identify it. There was more evidence here that the dunes are teeming with life. These tracings mark the paths of small creatures, probably insects. and every person a mission." Inside the forest, I wondered what had been living in this old snag. The trees were all decorated with Old Man's Beard lichen which is only found in old-growth forests. It is also called Witch's Hair. In the trees I could hear "Pip-pip-pip-pip-pip"-Pileated Woodpeckers, Spotted "Tow-heeeeeees" and Black-capped "Chick-a-dee-dee-dees." There is no love of Heaven"
The trail emerges from the forest at the edge of Cranberry Lake. Another "flotilla" of gulls was happily bathing and splashing in the fresh water. This seems to be a morning ritual here, as I have seen it before. I was fascinated by the dragonflies which flew right up to check me out. "Who are you? What are you doing here? Get off my lawn." At this point, I got back in my truck and returned home. I decided to come back later in the afternoon to catch some shots of the bridge that I couldn't get earlier. It is now 3:30 in the afternoon, 15:30 to some, and the sun is in prime position for some bridge photos. 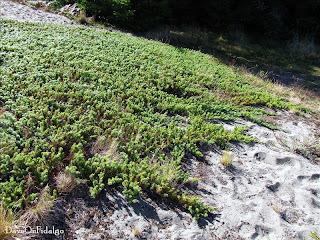 This time, I have returned to Bowman Bay on Fidalgo Island. 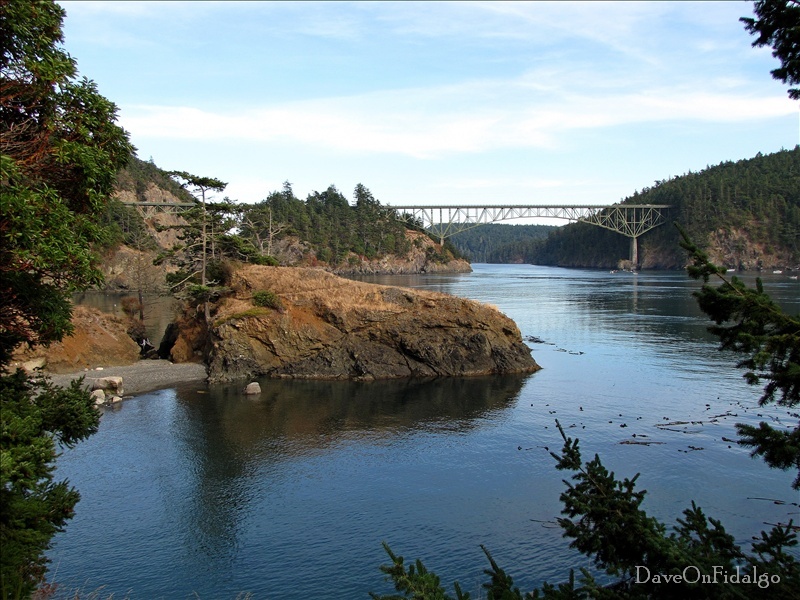 I am taking the trail to Lighthouse Point which provides some of the best views of the Deception Pass bridge. Normally under water, this marsh has almost completely dried up in late summer. More dragonflies buzzed up to check me out. Why were they so curious? They were like alien spacecraft studying a mysterious creature. 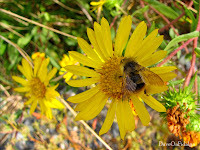 Entire-leaved Gumweed (Grindelia integrifolia) grows right on the gravel beach along the trail. 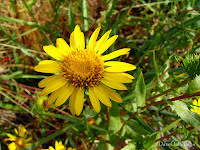 It blooms all summer and this will continue well into October. This beautiful aster should have a more agreeable name. "It has been a busy day. First one hummingbird, then another!" The trail continues along the tombolo which separates Lotte Bay (above) from Bowman Bay. It then veers to the right and enters old-growth forest with a short climb. Halfway along the trail, there is a large rocky outcrop where the first sight of the bridge is revealed. 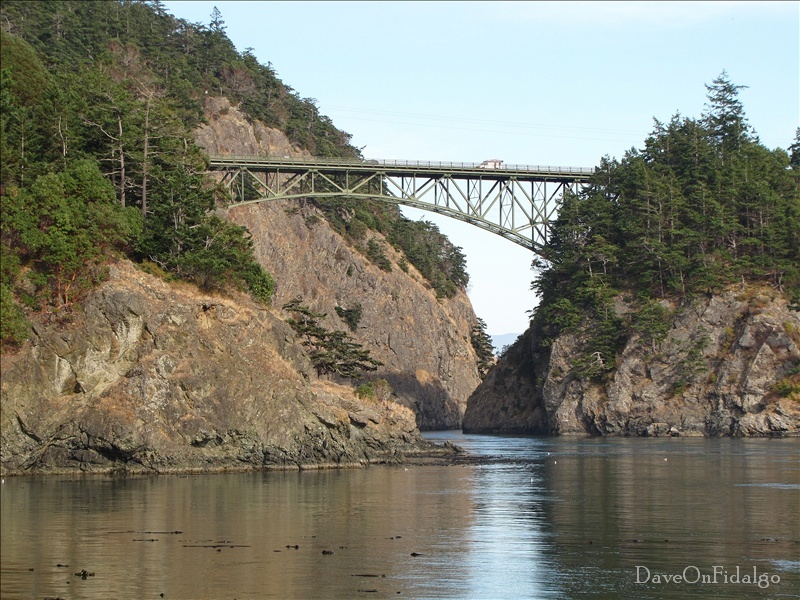 The Deception Pass bridge is actually two spans. The shorter span on the Fidalgo end traverses Canoe Pass (above). The longer span crosses Deception Pass on the Whidbey side. The headlands at Lighthouse Point provide some of the best views of the bridge. At 16:00 (4:00 PM) fair weather, calm winds and a gentle neap tide provided a peaceful setting. The bridge is reputed to be the most photographed structure in the State of Washington. Just gorgeous. Thanks for the tour. Your photos are beautiful. Love that squirrel! I sure miss being up there, especially since you had so much sunshine in August and September! Oh my favorite place again. Next year will have to take the motorhome there and hike the trail. It has been over 35 years since I have been there. I love the old snarled tree. Love the quotes you have added as well. Looks like it was a amazing beautiful day to visit. Have a wonderful weekend.